We don’t buy a lot of prepared potato products at our house – I like to control quality and cost; so often, the bagged variety disappoints and has additives I’m not entirely sure about. Although I’ve never tried them, I’ve seen frozen twice baked potatoes at the store, and they are pretty pricey – $1.76 for two 5 ounce halves. Four are $3.52, but four of these are 76 cents. My answer to this: Freezer Twice Baked Potatoes. I’ll make up a lot in the fall when potatoes are at their lowest cost and put them in Ziploc bags. Fall is often when I can find cream cheese on sale, too, as well as butter. For these everyday potatoes, I’ll generally use the five or ten-pound bags of potatoes and pick through them to find the potatoes that are most uniform in size. The rest get set aside for other dishes where the size doesn’t matter so much. When company comes, I may splurge and buy the large, gorgeous potatoes sold individually. But for our use, I’ll save the additional cost and calories. Not that these are low-calorie (see below how they may have fewer calories than Ore-Ida French Fries). I do jazz them up with a lot of dairy, but they are not terribly large. You could certainly make them lower calorie and vary the ingredients. What’s important is that the potatoes must be a thick, heavy mash or they won’t hold their shape when baked later. Twice Baked Potatoes from the Freezer – This is what happens when you ask your child to sprinkle a little extra cheese on them! 🙂 They were good, though! 3 tablespoons green onion or chives, chopped. Scrub potatoes, pierce gently with knife and bake until soft, 45 to 50 minutes. Remove from oven and let cool a few minutes. Divide the cream cheese, butter, sour cream into two bowls. Slice potatoes in two along the length. Using a tablespoon, and holding the potato in a clean oven mitt, scoop the flesh, leaving behind a small border in the potato. Put half in one bowl, and half in the other. Beat the potatoes with a mixer, add salt and pepper. (You could hand mash, but this is an instance where its good to build up the starch in the potato – it helps it hold its shape.) You may need to add a touch of milk. Mix in by hand the green onion or chives, and cheese if you’re using. Pile the filling back into the potatoes (I line them up on baking sheets) and freeze. Once frozen, divide them up into Ziploc bags in appropriate servings for your family meals. These can be baked, frozen, on a small cookie sheet or plate, or even microwaved. Sometimes I’ll thaw them, then bake them through – they tend to hold their shape better if thawed overnight in the fridge or even defrosted in the microwave, rather than just microwaved. Look for sales on all of the items below during the week before or during any Holiday, especially Christmas, Thanksgiving and Easter. Butter: $2.49 a pound, our cost: 97 cents. If you end up with too many skins or too many potatoes, don’t discard them! Turn extra potato into Baked Potato Hash Browns and any extra potato skins into Baked Potato Skins. Per Serving: 266 Calories; 20g Fat (68.3% calories from fat); 7g Protein; 14g Carbohydrate; 1g Dietary Fiber; 61mg Cholesterol; 224mg Sodium. Exchanges: 1 Grain (Starch); 1 Lean Meat; 0 Vegetable; 0 Non-Fat Milk; 3 1/2 Fat. Per Serving: 209 Calories; 16g Fat (66.7% calories from fat); 4g Protein; 14g Carbohydrate; 1g Dietary Fiber; 46mg Cholesterol; 136mg Sodium. Exchanges: 1 Grain (Starch); 1/2 Lean Meat; 0 Vegetable; 0 Non-Fat Milk; 3 Fat. To give you an idea of where these fall on the nutritional scale: If a family of five split up a bag of frozen Ore Ida fries, they’d each be eating (on average) about 390 calories, 19 grams of fat. If one ate just a five-ounce potato, baked, nothing on it, they’d be eating 133 calories. Add a tablespoon of butter: 235 calories. So there is a lot of dairy in the twice baked potatoes, but it is divided up into 32 servings. I’ll often add a little bit of cooked, chopped bacon and a sprinkle of cheese at the end of the baking process. (When I make bacon, I’ll sometimes put a bit aside in a sandwich bag and tuck it into the Ziploc with the potatoes. It will recrisp as it warms in the oven.) As said above, you could vary the dairy. You could add bits of herbs to lend more flavor. 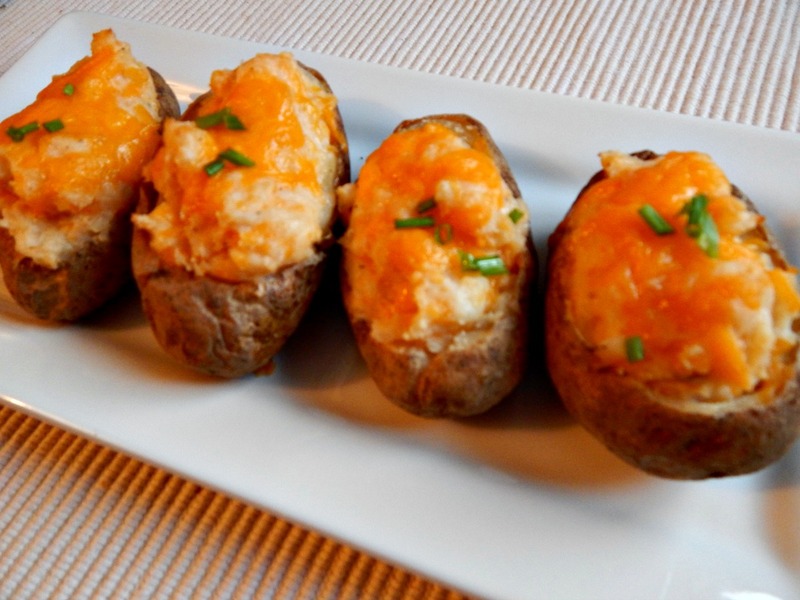 How do you jazz up your twice baked potatoes? Do you have a favorite recipe you like to make for frozen twice bakes or special ingredients that you add? This entry was posted in Click here for Fabulous Food Posts and tagged Cheese, Cream Cheese, Freezes Well, Frugal Hausfrau, hearty sides, Potatoes, Side, Sour cream, twiced baked potatoes, Vegetable Side. Bookmark the permalink. I am going to try this out. After you thawed them out how long did you bake them in the oven for? or microwave them? I bake them for about 15 to 20 minutes, and they go in the microwave for about two or so. Microwaves vary a lot. I do kind of watch them, and it depends, too, on the exact size of the potato. If they get really hot, the cheese bubbles up and gets a bit liquidy and they aren’t quite as pretty, but they are every bit as good – even better, actually. I hope you like them, Sara! I forgot to say that when I bake them, I sometimes test them with a butter knife for doneness – I just put the knife in the potato until it gets to the middle and pull it right out – if the tip of the knife is good and hot, I know the potato is hot all the way through, and the potato isn’t messed up. I do that with casseroles and other things, too. Thank you for the pingback, appreciated. Like the recipe and the idea of freezing the potatoes for a later time. Genius! Thanks, Laura – when you have them frozen on hand, they’re just perfect for hectic days when you need to fill something out with a side.